Their first commercially successful design was the Morane-Saulnier L, used as a fighter during the early days of World War I. They worked with Roland Garros to develop a system to allow the machine guns to be mounted on the front of the aircraft, shooting through the propeller. However their early models did not work well, often resulting in the propeller being shot away. In 1915 Garros fitted additional metal wedges to his propeller to deflect the bullets that didn't synchronize properly, and soon started racking up an impressive victory list. Morane-Saulnier delivered a number of more advanced versions of their basic monoplane design, but by 1915 a new generation of biplanes was completely outperforming them. One design would leave its mark after the war however, the LMS Parasol was an adaptation of their latest L model monoplane with the wing moved over the fuselage for better visibility downward. After the war they produced a number of designs for training and general aviation, but with the start of World War II looming they once again turned to military aircraft. During the late 1920s and early 1930s they produced a number of parasol fighters including theM.S.230. The MS.230 was a training aircraft that was also used as a hack by many units. 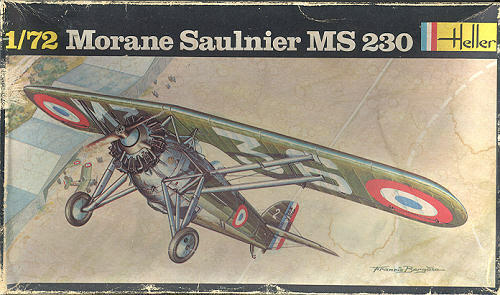 Most pilots trained for the French Air Force during the 1930s flew the MS 230 as it was a safe and stable aircraft that was also capable of aerobatics. Also constructed in Portugal and Belgium, over 1,100 examples were built. A single seat version, the MS 234 was also constructed. Several 230s and 234s are still extant, one being used as the Fokker D.VIII in the movie 'The Blue Max'. When Heller started producing kits in the late 60's/early 70s, they concentrated on aircraft of French manufacture and the result was a number of very interesting and esoteric kits. Many of these have yet to be produced by anyone else. 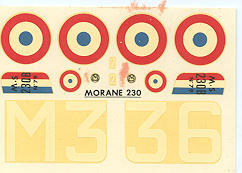 The MS. 230 was among those kits. Heller's kits were considered by many to be the best available at the time. The detailing was superlative with finely raised panel lines and nicely done fabric representation that may seem a bit overdone today, but is still quite nice. My kit is an oldie and includes the small tube of cement that was considered the norm for kits back then. There are no sink marks, no ejector pin marks in unwanted places and one really has to hunt for any flash. The 44 parts include a very nicely done engine with both intake and exhaust detail as well as a nicely done prop. It is such that the engine can be installed at the very end. The interior is a bit bare in comparison to modern kits, but does contain two seats and two sticks with a floor section for the GIB (Guy in Back). The two piece wing has the ailerons molded with the lower wing to provide a sharp trailing edge. Attachment holes for the struts are large and should provide a positive locator. Holes are drilled in the tail section for rigging and are, unfortunately, way too large. 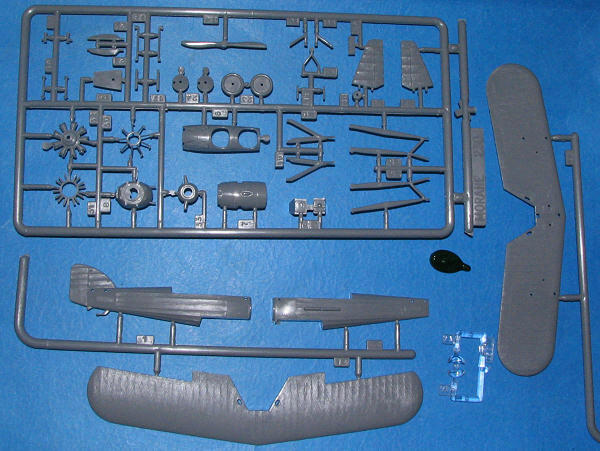 This is a problem with Heller kits as their Gladiator, another fine kit, is somewhat spoiled by these huge rigging holes.. Two small windscreens are also provided. They are thick, but adequate. Instructions are a major exploded view with some smaller detail drawings. The camo and markings information is on the same side of the sheet. A short history and parts listing is included. The drawing side of the sheet is in French with this information repeated on the back in English and German. Typical of the day, there is a running construction sequence "glue part 1 into part 2" sort of thing, but most of us will totally ignore that. The lone scheme is for a very standard aircraft with the metal bits in unpainted aluminum and the fabric in a green khaki. The decals are well printed, very matte, and horribly yellowed. Most can be salvaged if need be but replacements would be a great idea. Roundels won't be impossible to find and the tail tri-color can be painted. Locating the large code letters for under the wing may be the difficult part as will the data for the rudder. Though probably not in current production, one can always find these kits at swap meets and generally for a buck or two at the most. A real shame that they don't get built more often as they really are nice kits. Do yourself a favor if you find one; buy it and build it. I think you'll find them to be quite worthwhile.